Win this original preparatory my painting worth £180 of Cromer Pier, Norfolk. Sign up to my newsletter and you can enter the free draw to win this original preparatory painting worth £180 of Cromer Pier, Norfolk. 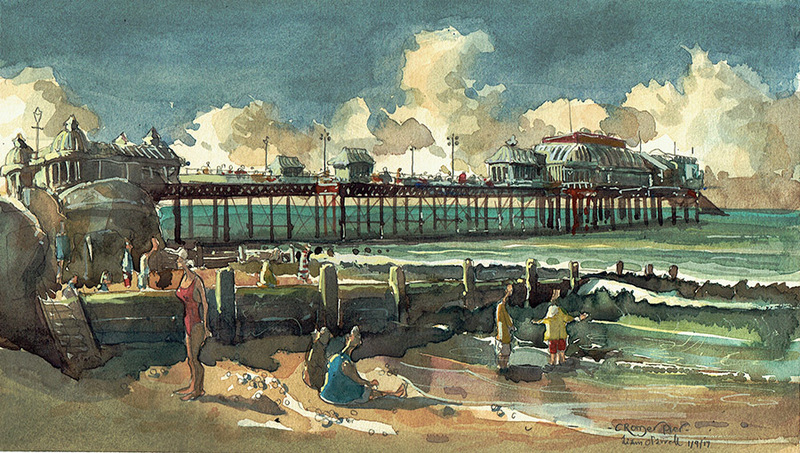 This watercolour study of Cromer Pier is 26.5cm x 15cm, signed and mounted on acid-free card. The newsletter will be sent out on the 15th September 2017. I look forward to your sign up in the box on this page. I always see piers as a bit of a Victorian invention, although there has been a Cromer Pier since 1391 presumably for industry rather than pleasure. A promenading pier was built in the mid 19th century although this was totally destroyed in 1897 when a hapless coal barge crashed into it. Its current incarnation comes from 1902 and is 450 feet (140 m) long. Originally, Cromer Pier had a bandstand and a roller skating rink too. Currently it hosts a busy theatre accompanied by a large lifeboat station, complete with a precipitous ramp perched right on the end. I don’t know why we British have such a love for these odd structures. Why do we need to wander out on them, only to wander back again? Is it a bit like going on a ship? Or is it the feeling of space? I have no idea, though every time I see a pier I too want to walk out right to the end, have fish and chips, then wander back again with the feeling like I have achieved something. On the day I visited Cromer pier, it was a warm afternoon and was teaming with families. The main pastime being crabbing. This entails small children lowering string into the water with a stone and a bit of bacon on the end. Then juggling it around the bottom for a bit before carefully pulling it up to see if some pugnacious crap is clinging onto the end, steadfastly refusing to give up its dinner. This wee fellow is then bucketed with other crabs. The game is to get as many crabs as possible, with an extra bonus for the largest crab. Once the game is over, all the crabs are tipped back into the sea. The population below must get ‘alien abducted’ three of four times a week without getting a free meal out of it. Cromer Pier is the ‘Area 51’ of the crab world. On this day I decided to eat my seaside lunch on the beach, and paint this view. I hope I get around to producing an oil painting of it one day. I would love to win your Cramer Pier painting….and some day see it for myself, the pier that is. I will be coming to England April 2018 on an Art & Archectural tour. Love your work.